My folks had the old style champagne glasses: the flat ones that hold a tiny amount. When I was a kid, I thought it was awesome to stay up on new years and drink Tang out of one. This year there will not be Tang in my glass. It has been a great year, 2012. Farming is always challenging, the world shifts constantly, and what we get to do here adjusts accordingly. Much has been accomplished since we moved here: the first year was the most challenging, the most exhausting, the most taxing. There are projects we want to begin and complete on the farm, and plans in place, but the critical, can't function without it infrastructure has been put in place. In 2013 we want to locate a dog that will patrol the property at night, to live warmly in the 2013-2014 winter, to host a few more meals and events here, and to continue to grow all that we have here in the past. Beef, pork, chicken, eggs, turkeys and vegetables. Chemical free. We will launch our Speedy Seeder Kickstarter campaign on January 2, 2013. Homer keeps working on planting an accurate number of seeds each week so that our harvest is correct through the CSA season, and the Speedy Seeder is his answer. He patented a tool years ago and the results were a great learning experience. 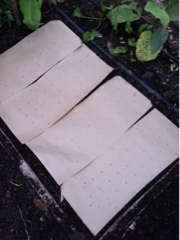 We know Homer's Speedy Seeder works, for accurate number and placement of seeds and to prevent weeds. And we know that producing less than 800 units does not make sense financially. But to produce that many and not sell them means we would bankrupt ourselves. It is astonishing that Kickstarter exists for product launches like ours. If we don't sell or raise enough to get to our financial goal we don't get a dime and we do not produce a single Speedy Seeder. If we hit the goal, we put a lawyer, web designer, tooling designer, production and assembly, box maker...all within 50 miles of here, to work. UPS too, to get orders to people who order them. But if we don't get to goal our lives go on, as we have for several years here, growing, harvesting, taking to market all that we grow. Kickstarter allows an idea to spring from a brain and become a reality, all by offering a platform to demonstrate an idea, to show how it has worked with our winter plantings that went in the ground in September, October and November. Our video, as you will see, has sound deficits. In portions of it the tweeting birds almost drown Homer out. Shot with his iPhone propped up on a home made stand, in less than 5 minutes it shows start to finish the reason why he uses the Speedy Seeder for planting, and why it is such a help in growing from seed. Any seed. Vegetable, herb or flower. Astonishing. That a platform like this exists, that creative people like Homer and thousands of others can dream up ideas and communicate them to people all over the world. It costs nothing to submit, nothing to run or operate unless we are fully funded, and then a percentage of pledged amount goes back to Kickstarter. In the meantime we are not strapped financially. We can monitor and let our local partners know the status, can help them plan and schedule our work and production time. Can continue to do our daily chores, get eggs packed, food delivered, repairs made all without worry of losing the farm going into debt. A staggering number of businesses fail in the first 5 years. We have been fortunate to operate the farm for more years than that, and each year we manage to make a living at this. Not fancy, but lovely. Not rich in money but rich in time, in energy, in friends, in family, food and fun. We do not have to risk our home or time to offer The Speedy Seeder: we will know by mid-February if we can manufacture these, and will have them shipped out for the 2013 growing season. And at the same time can milk the cow, make a little cheese, pack some eggs and get ready and be ready for the intense growing season of 2013. We just love that, and marvel at it. This is a great country. And a land of true opportunity. We are happy for the opportunity.